Sleep is one of those time consuming things that I often take for granted. I think it’s the consequence of being a perpetually sleep deprived student. Recently, my husband and I purchased a brand new firm-but-soft-super-comfy mattress and I LOVE it! I find it hard to leave my bed, especially after our sheets are freshly laundered. Ohh sunny Florida. Last summer when I first moved back to Orlando, I started using a beauty balm with SPF for the first time ever. I felt that my impending 30th birthday + the intense amount of sunshine were good reason to lather up. Lately I’ve been seeing LOTS of infographics online about the SPF properties of carrier oils and I started to wonder if there was any truth to them. I did some research and found that oils DO contain low levels of SPF. The internet is full of information and misinformation. Some people believe that DIY sunblock is safe and effective, others think it’s a ridiculous idea. I’m in the camp that chemicals are bad, a little sunshine is good – everyone needs Vitamin D! Most commercial sunblocks are chemical laden because they contain physical and chemical sun “blocks”. The recipe I’m sharing with you is for a physical sunblock. To learn more about what that means, start here. 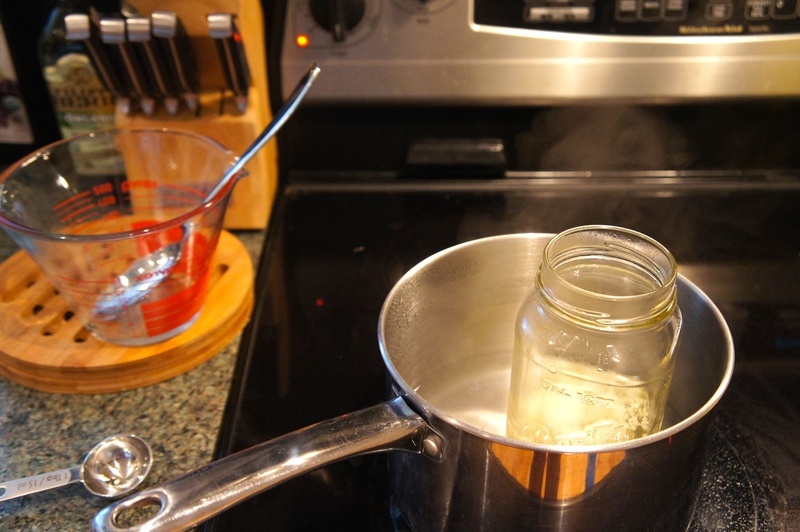 Create a double boiler. I took an old spaghetti sauce jar and placed it in a water bath. Next, add your oils and warm them. Once warm, add the beeswax pellets and stir to melt. It took approximately 10-15 minutes for my beeswax pellets to dissolve completely at low/medium heat. After you remove the oils from the heat, carefully add your Zinc Oxide. You’ll have to stir the mixture well to incorporate the Zinc Oxide evenly. Transfer to bottle or jar for use. When working with Zinc Oxide, take extreme care not to inhale the particles. Cover your nose and mouth with a bandana, t-shirt or mask. Do not mix around children or pets, just to be safe. 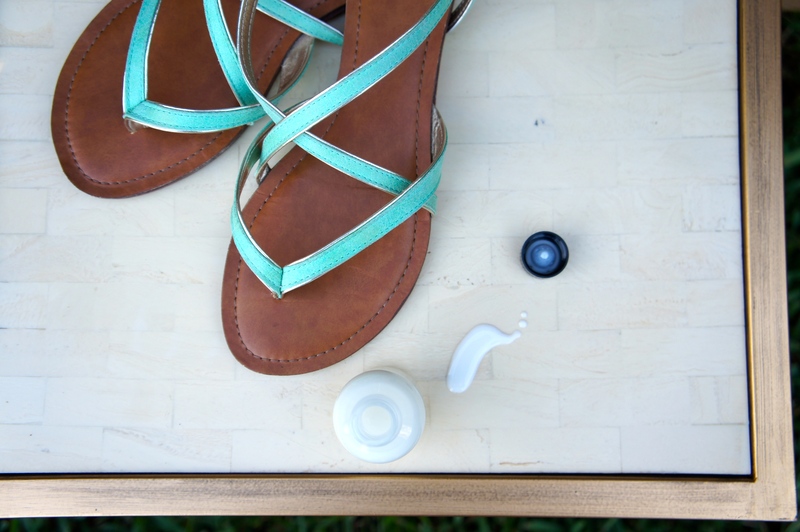 According to this research, Coconut oil has an SPF of 7.1 and Almond oil has an SPF of 4.6. 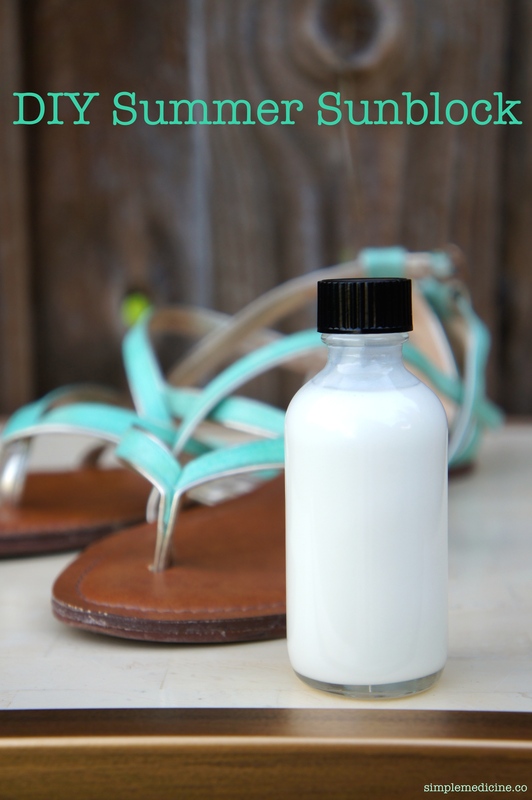 The amount of Zinc Oxide added to this recipe gives you an additional SPF 20. I haven’t lab tested my sunblock recipe, therefore I can’t say for certain what the SPF level is, but based on my research, it has at least an SPF of 20, if not more. 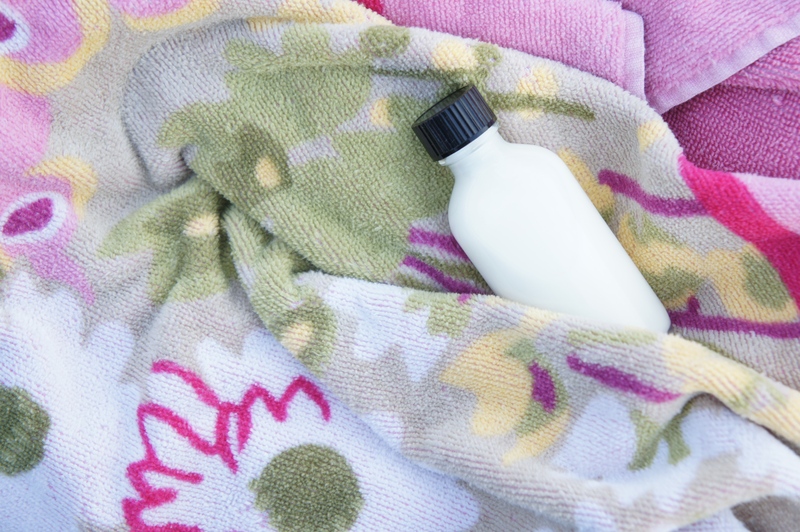 There are other DIY sunblock recipes out there, and some recommend using essential oils to fragrance your sunblock. I chose not to use any fragrance because I used coconut oil and it gives the sunblock a subtle, beachy smell. Use caution when choosing essential oils as some are phototoxic. If you’re looking for a natural sunblock sans the DIY, visit my Etsy shop to purchase this item. The best protection from the sun is to stay in the shade or wear protective clothing and a hat. While I did my best to provide evidence based reasoning for my DIY sunblock, I can not be held responsible for any adverse events that occur from the use of this recipe or product.